Stunning salmon-pink flowers! 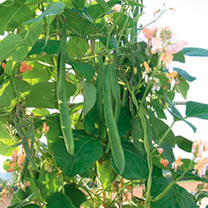 A very early maturing English-bred runner bean, which produces a good crop of smooth, tasty pods up to 30cm (12") in length. Good rust resistance. RHS Award of Garden Merit winner.